Technology. Some treat it as the downfall of our civilization, some treat it as the answer to everything. Me? I see it for what it is…a gift that can be used in many wonderful ways. We recently planted a plot of sweet corn. What does that have to do with technology? Well, this isn’t just your run-of-the-mill Grandpa’s sweet corn. This is Bt sweet corn developed by Monsanto. 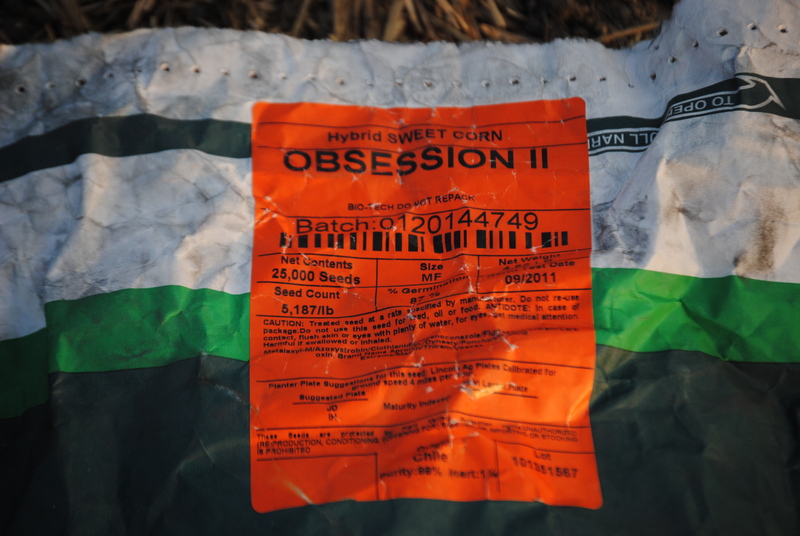 Our sweet corn seed bag from Monsanto…and I can’t wait to harvest this crop! Now, I say “developed” because the seed itself is just a simple corn seed, it’s the traits of the corn that makes it special. This corn is more resistant to bugs, which makes it less likely that we’ll need to use pesticides on it. The corn is also hardy to herbicides, meaning that we can use the same chemical that millions of homes use everyday when needed to kill the weeds in the field, limiting the competition to the plant and improving the corn yields. That means more corn with less cost, less trips up and down the field, and less soil disturbance. The fewer times we have to disturb the soil, the better our soil health is, and the less we lose to erosion. A win-win. It’s not just the sweet corn that has me thankful today. It’s the possibilities that this corn presents. 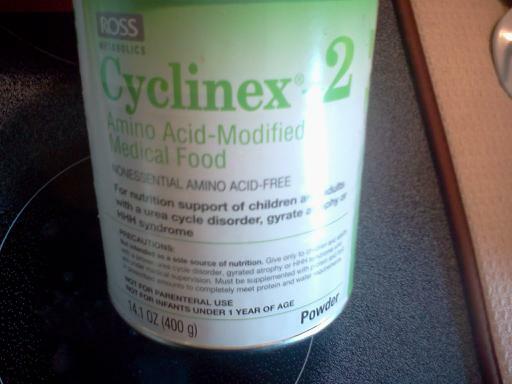 This is George’s formula…it stinks to high heaven and I have to hide it in different foods and stuff, but it’s what he needs. And that’s all that matters. Yes, George is still on formula. And he’ll be on this special formula for the rest of his life. I’m thankful for this can, because without it, I’m not sure what we would have done, or what would have happened. But I don’t need to worry about that. So what does this can of formula and a cob of corn have in common? Imagine: if we can make a cob of corn that is resistant to bugs and herbicides, maybe we could eventually make a version of meat that has limited protein in it. Maybe we could make a dairy product that George could drink (and I’m not talking coconut beverage or soy substitute). Maybe we could make a pizza, complete with cheese and toppings, that would be easy and tasty for him to enjoy. No, this cob of corn is not just a simple treat for my family to enjoy in a few months. It’s not just a soil-saving, resource-saving, farm-friendly crop…it’s a sign of what we can do when we take the time to investigate and do some research. George, enjoying some yummy sweet corn! I know what research did for us in the past. I see him every morning, waking up with an amazing smile and a great zest for life. It’s where the research leads us in the future that has me excited…and I hope, for George’s sake, that nothing stands in the way. 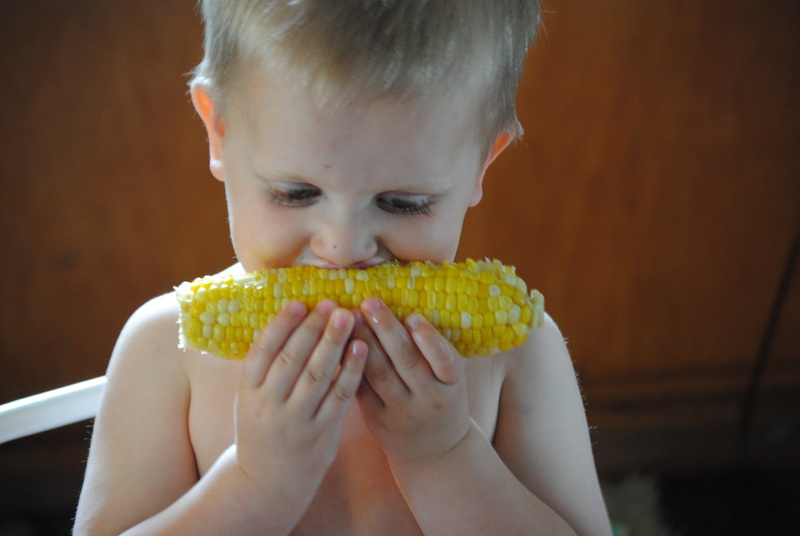 I am thankful that Monsanto provided us with the sweet corn seed, but please remember that the thoughts, ideas and opinions are my own…as well as those cute photos of my boys. Thank you! This entry was posted in Corn, Food freedom, Thankful Thursday and tagged agvocacy, biotechnology, farming technology, feeding the world, food choices, new technology, ornithine transcarbamylase deficiency, sweet corn by wagfarms. Bookmark the permalink. After reading this post about your boy, I have a book suggestion for you. “The Boy Who Changed the World” by Andy Andrews. It’s about farm kids who grew up to make a difference in the world & how they are connected. Your boy will love it. I will be posting about it everywhere. Consider it on my next-to-read list…and thank you for the suggestion! Technology is so exciting… and truly life-altering. I’m so excited for the advancements and relieved that they’re making a difference for you and George! You’re so right, technology IS exciting! I cannot wait to see what the future holds! Lobe to know when we can get that in Canada! Getting tired of spraying residual spray in our garden plot of sweet corn! That’s the part I’m looking forward to the most! Less work, less chemical and more reward! Yay! Wayne, down where I am we don’t use Bt in sweet corn. Yellow spray planes go back and forth, each time dumping 1000 lbs of pesticide into the environment and onto our food. Someday we’ll use the Bt solution too as a much more sustainable solution. Wow, Ted your response just plain left me speechless. Without knowing what specific products and amounts used on this farm you have made a discovery even the best medical doctors in the world could not. To think of all the stress and anxiety these parents have had not knowing at times if their son would be coming home from the hospital and all along you knew exactly what the problem was. Agent Orange is such a misleading term when talking about agriculture. Defoliating a jungle in war time and on farm weed management are not the same thing in chemistry or application. It’s simply a scare tactic used to sway the opinion of those who don’t know better. Correlation does not equal causation. You’ve made a lot of unfair assumptions here based on not much frankly. Thank you Val for this post! With every post from farmers through planting, growing, and harvest season, I learn more about farming that I have yet to experience in life! Keep pressing on! Technology is a great thing. you make running a blog glance easy. The entire glance of your web site is fantastic, as smartly as the content material! =). We may have a hyperlink exchange agreement between us. Many thanks a great deal regarding revealing this particular along with everybody you truly realize what that you are conversing around! Organic meat have a very weblink swap agreement among us all. easy to obtain a blessing.